Ned Desmond has gone fishin' and he wants you to Go FISHn too. Today, Desmond launched a fishing site for the Facebook age. You can sign in with your Facebook ID, share fishing stories and photos with your friends, ask questions to fishing pros and the community, and review all the gear in your tackle box. Go FISHn is an enthusiast site for people who love to fish—and there's an estimated 30 million recreational anglers in the U.S. alone who spend about $45 billion a year on gear, supplies, and trips. "Nobody has done a good job in enthusiast sites," says Desmond, who is the former president of Time Interactive and was once my boss (we launched a magazine together). 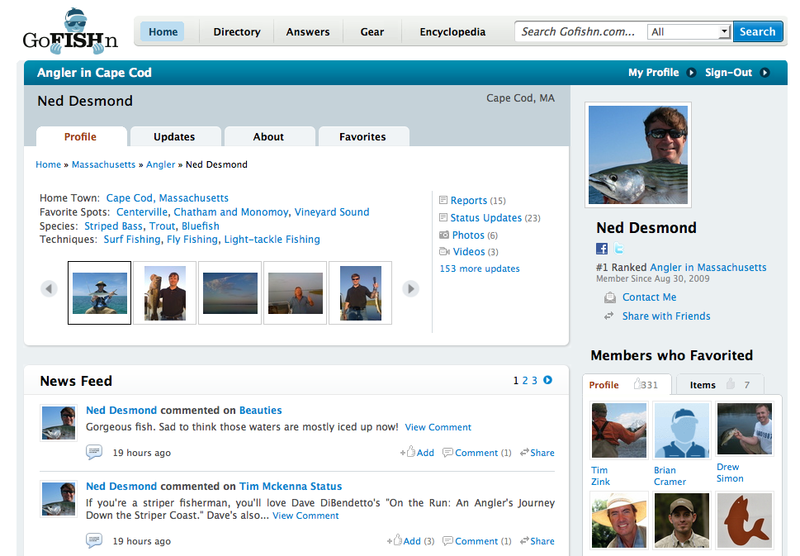 There are other social networks for fishermen such as Angling Masters, Fishing Files, and the Fishing Network where people can share fish tales and photos. But they seem to be modeled more after MySpace than Facebook. Go FISHn isn't trying to create a new social network. "People fish for the challenge, but also for the companionship," says Desmond. Go FISHn starts out by connecting you to your fishing buddies on Facebook (and, yes, it has a Facebook Fan page as well). Ned Desmond has gone fishin’ and he wants you to Go FISHn too. Today, Desmond launched a fishing site for the Facebook age. You can sign in with your Facebook ID, share fishing stories and photos with your friends, ask questions to fishing pros and the community, and review all the gear in your tackle box. Go FISHn is an enthusiast site for people who love to fish—and there’s an estimated 30 million recreational anglers in the U.S. alone who spend about $45 billion a year on gear, supplies, and trips. “Nobody has done a good job in enthusiast sites,” says Desmond, who is the former president of Time Interactive and was once my boss (we launched a magazine together). There is something deeply satisfying about seeing an old boss of mine from my mainstream media days embrace niche media. Go FISHn is the first site from his new company, Go SPORTn, which will take the same model and create communities for different enthusiast groups much in the way magazines like Field & Stream used to do. “I think a mass audience is the ability to address a lot of niches within a category,” he says. Hmm, where have I heard that before (cough, nichebusters)? What’s even more satisfying is to see him do it so well with a bootstrap budget, five engineers in India, and a few other contractors. The whole site was built on Rails, MediaWiki, and the Sphinx open-source search engine. I’m obviously biased because Desmond is my friend, but judge it for yourself. There are other social networks for fishermen such as Angling Masters, Fishing Files, and the Fishing Network where people can share fish tales and photos. But they seem to be modeled more after MySpace than Facebook. Go FISHn isn’t trying to create a new social network. “People fish for the challenge, but also for the companionship,” says Desmond. Go FISHn starts out by connecting you to your fishing buddies on Facebook (and, yes, it has a Facebook Fan page as well). 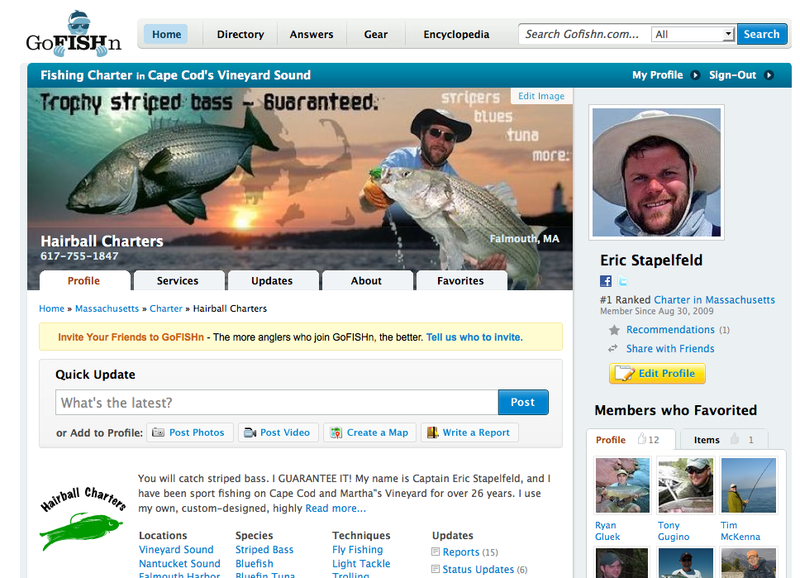 Once you join, you can add fishing-related status updates, longer blog-post-length stories, and fishing photos and videos to your Go FISHn data stream and share those with your friends on Go FISHn as well as on Facebook and Twitter. The site is also designed as a social marketing tool for guides, charters, outfitters, lodges, and other small businesses. They can have their own version of fan pages which are more likely to show up on Google than their own Websites, and it gives them an opportunity to connect with potential customers. For instance, there is a Q&A part of the site where anyone can ask or answer questions, with the best answers being voted to the top. Pros can get in front of potential customers by providing the best answers to the fishing questions they are expert in. Another section of the site is the reviews. Anyone can write a review about their favorite piece of gear. These products are linked to affiliate sales via Bass Pro Shops and Cabela’s. Underlying the site is a database of about 100,000 fish species, lakes, rivers, fishing gear, guides and outfitters which helps to create a consistent taxonomy throughout the site. So whenever you post a report or ask a question and start to tag it, an auto-complete suggests the names of species, gear, and so on. Anyone later searching for those topics will be able to find your updates. The taxonomy also makes possible an online fishing encyclopedia seeded with licensed content, built on MediaWiki. But first, he has to prove the model with Go FISHn. The bait has been cast. Will anglers bite?